May we introduce you to a young man named Thembelani Maqajana? Thembelani lives in the Khayelitsha district of Cape Town, is married with a 7-year-old son, and is a teaching elder at Makukhanye Baptist Church. 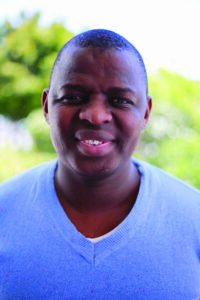 Thembelani is also someone who has benefitted through SIM SA’s Church Leadership Training Fund. The fund provides partial scholarships to Bible college students studying to develop leadership skills for their continuing church ministries. Applicants must also have the support of their home church for their studies. Some are in full-time training to be pastors, while others are training to be better equipped for their ministries within their local church. The programme has been helping students since 2004; this year, the fund awarded eleven scholarships totalling over R51,000 to a variety of people from both urban and rural churches. Awards are determined annually by representatives of SIM and its partner churches, Africa Evangelical Church and Evangelical Church of South Africa. Across South Africa, there is a need for pastors and teachers to receive sound Biblical training, equipping them to teach and train others. We are excited to be working with churches and individuals around South Africa, supporting the training of the next generation of leaders so they are “thoroughly equipped for every good work” (2 Timothy 3:17). Please quote the project number ZA86474 when donating and let us know about the donation on za.projects@sim.org. Thank you for your prayers and gifts.